The RA0045-S1 Prepolarized Ear Simulator is for making acoustic measurements on earphones coupled to the human ear by ear inserts such as tubes, ear moulds, or ear tips. The acoustic input impedance of RA0045-S1 closely resembles that of the human ear and, as a result, loads a sound source in very much the same way. The RA0045-S1 embodies a number of carefully designed volumes connected via well-defined and precisely tuned resistive grooves. In an equivalent electrical circuit, capacitors would represent the volumes, and inductance and resistance would represent respectively air mass and air flow within the resistive groves. The RA0045-S1 is for measurements on earphones and hearing aids coupled to the human ear by ear inserts such as tubes, ear moulds, or ear tips. It is also part of the GRAS 43AC-S1 Artificial Ear. 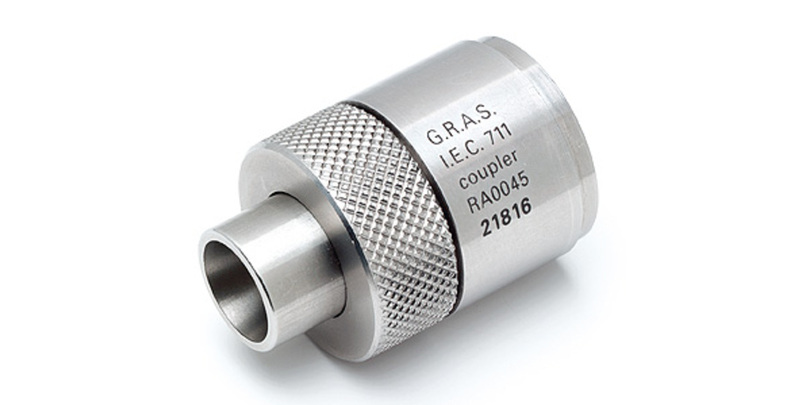 The RA0045-S1 can be used with a standard CCP preamplifier, e.g. the GRAS 26CA 1/2" Preamplifier or the GRAS 26CB 1/4" Preamplifier fitted with an adapter. For the 1/4" preamplifier, use either the straight RA0003 Adapter or the right-angled RA0001 Adapter.